In the introduction to the epic book Peace, Love, and Barbecue, food critic Jeffrey Steingarten shares this advice, “Tips, we learn, are so much more important than recipes…” After taking a six hour class from BBQ champion Dana “Big Papa” Hillis of Naples, Florida – I realized that is exactly what my takeaways were. Yes, there are some recipes posted down below, but actually they are more like methods and procedures – with a lot of wiggle room. Barbecuing via smokers is a process and everyone puts their own spin on it. So enjoy these recipes and tips that were shared with me, and please comment below on how you do it! *Spoiler alert – Hillis’ approach is all about BBQ competitions, or in other words, winning a judge over at first bite; he uses a lot of butter and sugar! 1 meat – 6 oz. per person. “Clean grill while it is still warm” – use scraper or wad of aluminum foil. Use piece of paper towel – some people use pliers. However, sometimes the skin is already off. Use the 3 – 2 – 1 Method. Usually, this means 3 hours of smoking,unwrapped at 225 degrees, followed by 2 hours of cooking wrapped in foil (with a little liquid, such as apple cider), followed by 1 hour of cooking unwrapped at a higher temperature, with a generous basting of barbecue sauce. Indirect heat for about 3 hours – between 230 degrees and 240 degrees. Hillis feels like 234 degrees is the optimal temperature and usually for him, this three hour part is more like 2 1/2 hours. “When you start seeing bones pull back, they are ready to be pulled off.” Then he slathers the meat side with butter or margarine, honey, and brown sugar. He wraps the ribs in foil, meat side down, and puts them back in the smoker. By the way, Hillis says all honey is not alike, “Clover honey is bland and o.k. for sauces, but orange blossom type honey seems to overpower the sauce flavor.” After a couple hours, take the ribs out, unwrap and let the internal temperature cool down to 140 degrees. Then wrap the ribs back up again and let them sit for an hour before serving. Put all ingredients in a zip lock bag(s) and marinade overnight. Cook at 350 degrees indirect heat, turning them over once after 45 minutes and cook until they get to 195 internal temperature. Hillis’s sauce for wings is Franks hot sauce mixed with honey and brown sugar – a departure from the usual Franks & butter. Trim the fat off of the pork loin, leaving about 1/2″ of fat on. Filet it by slicing it open lengthwise being careful not to cut all the way through, so it opens up butterfly fashion. Season, close it, and tie it with butcher string using a mattress stitch – insert needle on side where just exited, then take to other side and insert again on that side, taking it to other side and repeat. Sprinkle with more rub. Cook fat side down in 300 degrees indirect heat for 1 1/2 to 2 hours. Let internal temperature get to between 130 to 140 degrees. Hillis says 135 best, but don’t let it go past 145. Meat is graded as prime, choice, or select. Hillis uses choice and cuts the steaks 1″ thick. Give the steaks a “salt bath” – salt very heavy with coarse sea salt, leave on for 15 minutes, then wash the salt off. This opens the pores of the meat and allows seasoning in. Spray grate with Pam spray. Each time you turn or flip steak, move to the other side of the grill, quickly “cleaning” the now empty part of the grate with balled up aluminum foil, before closing lid. This ensures those really nice cross hatch grill marks. If you wish to grill a 1 inch pork chops, Hillis sprinkles them with with McCormick Brown Sugar Bourbon Grill Mates Seasoning and Montreal Steak Seasoning, then uses this method to cook to internal temperature of 135 – pink in the middle. When buying a brisket, look for piece of meat with lots of white streaks. Cut fat off to ¼ inch on bottom. Put rub on, and let sit in refrigerator for a few hours. Then, place in smoker -fat side down at 230 degrees. Leave it in there until the internal temperature reaches 170. This could take up to 9 hours. There is a period, called the “stall”, where the temperature seems to hover somewhere between 145 and 160 degrees. Just be patient, keep the temperature constant, and wait. Once it reaches 170 (a lot of websites say 165) take it out – it will look almost black on the outside – spray it with a bit of apple juice and double wrap it in butcher paper. Place it back in the smoker at 275 (again – a lot of websites have a different take – like temperature still at 230 degrees) and allow the internal temperature to come up to 198 degrees. Bottom line – the above is a suggested procedure – make it your own and keep data on your trials. Use the sweet small “snacking” peppers and/or jalapeños. While wearing gloves, cut in half, leaving stem on, and scoop out seeds and membranes. Place the peppers in a foil pan, place in indirect heat, and allow them to cook until softened. Stuff each pepper with the cream cheese mixture and sprinkle shredded cheddar cheese on top. Return to the indirect heat and cook until cheese is melted and bubbly. Wrap each tot with a piece of cheese, then a piece of bacon, and secure with tooth pick. Place each tot in foil pan. Cook 250 or above, until bacon gets crispy. Drizzle with BBQ sauce before serving. In a foil pan, place slower cooking vegetables on bottom and top, faster cooking in the middle. Cook about 3 hours at 300 degrees. Mix all ingredients together and place in foil pan. Use Dutch baker pots (can buy liners – otherwise cleanup is so hard) or use foil pans in indirect heat. Dump pie filling and pineapple in pot. Sprinkle cake mix on top and drizzle melted butter on top. Bake 350 degrees for 45 minutes in oven or in dutch oven with coals on bottom, coals on top. Put the melted butter in the bottom of a pan. In a bowl, mix together sugar, self-rising flour and butter milk. Put the flour mixture on top of melted butter. Then put canned peaches on top with a little bit of the juice. The “crust” will rise to the top as it cooks. 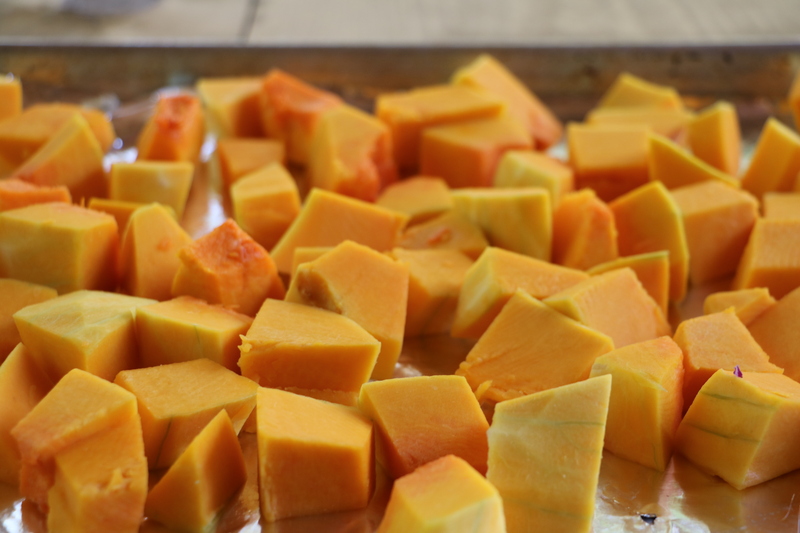 Every autumn, I seemed to be obsessed with butternut squash. I don’t think I’m alone because I keep getting notices from Pinterest that a pin I got from Simply Recipes on cutting butternut squash has been repinned about a hundred times. People out there must be cutting up oodles of butternut squash! 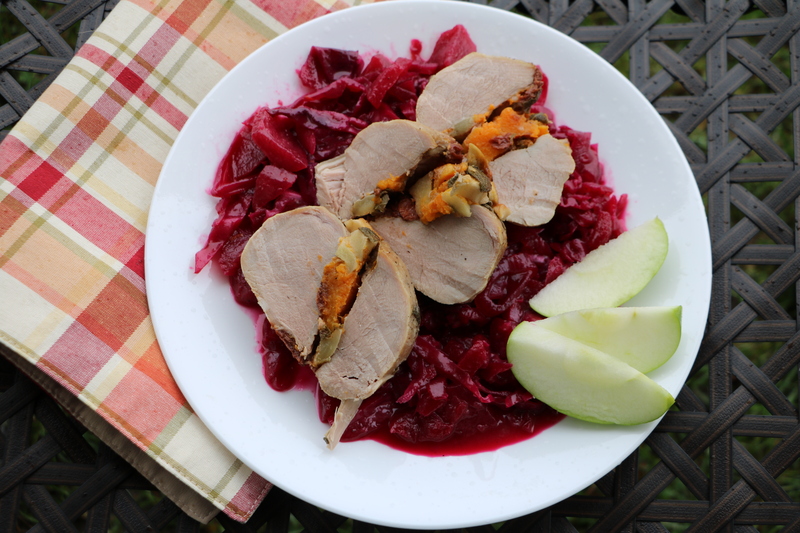 With that in mind, I came up with this fall dinner dish that is full of seasonal flavors. It’s just as scrumptious as it is colorful! Enjoy! Preheat the oven to 350 degrees. Cut the ends off of the squash and use a vegetable peeler to remove the skin. Cut the squash in half length wise and scoop out the seeds. Then cut each squash half again, separating the “bowl” from the top part. Cut both “bowls” and both top parts into 1/2 inch wide lengthwise strips. Then cut the strips into square cubes. Place on a foil covered baking sheet, toss with 1 tablespoon olive oil and sprinkle with salt & pepper. Bake 20 minutes to give the squash pieces a head start on getting tender once they are part of the tenderloin stuffing. While the squash is partially baking, prepare the tenderloin and stuffing. Trim fat away from the tenderloin and “butterfly” it by cutting it down the middle lengthwise, but not going all the way through to keeping it in one piece. Set aside. To prepare rub for the tenderloin, place 2 tablespoons olive oil, garlic, kosher salt, pepper, and 2 tablespoons sage in a bowl and mix well. Set aside. 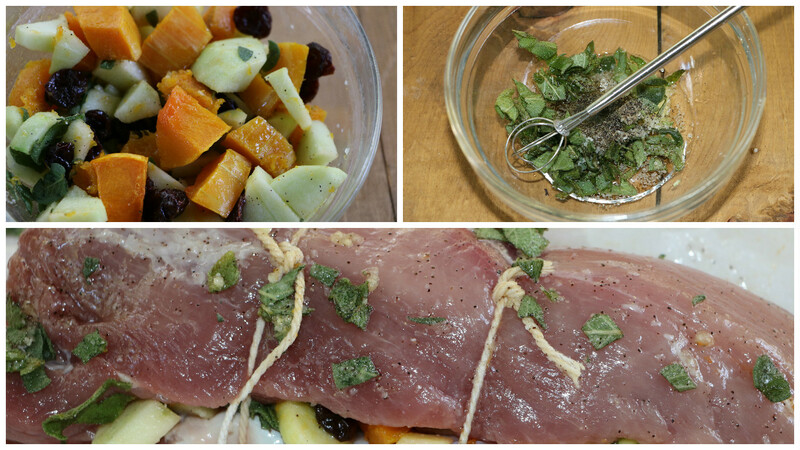 Open the butterflied pork loin up, and place the butternut squash mixture inside. Fold it back together, and use the 3 cooking twine pieces to tie the roast together. Take the rub paste and gently smear the outside of the pork loin. Make sure to get both the top and bottom covered. If any stuffing falls out during any part of this process, just tuck it back in. Place the pork loin on a foil covered baking sheet and place in the 350 degree oven. Bake for 1 hour or until a cooking thermometer inserted into the meat reads 160 degrees. Since this recipe calls for a 1 to 2 pound roast, that should be enough baking time. But – if you use a larger piece of meat such as 3 pounds – you will want to allot at least an hour and a half baking time. 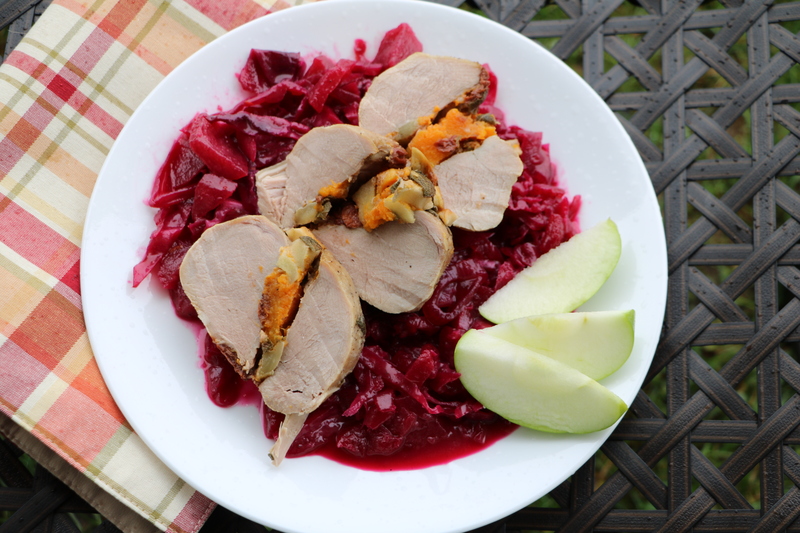 While the pork loin is baking, prepare the braised red cabbage. Place the 2 tablespoons olive oil, onions, and carrot in a pan and saute over medium heat 5 to 7 minutes until vegetables are tender. Add the garlic and saute for 30 seconds more. 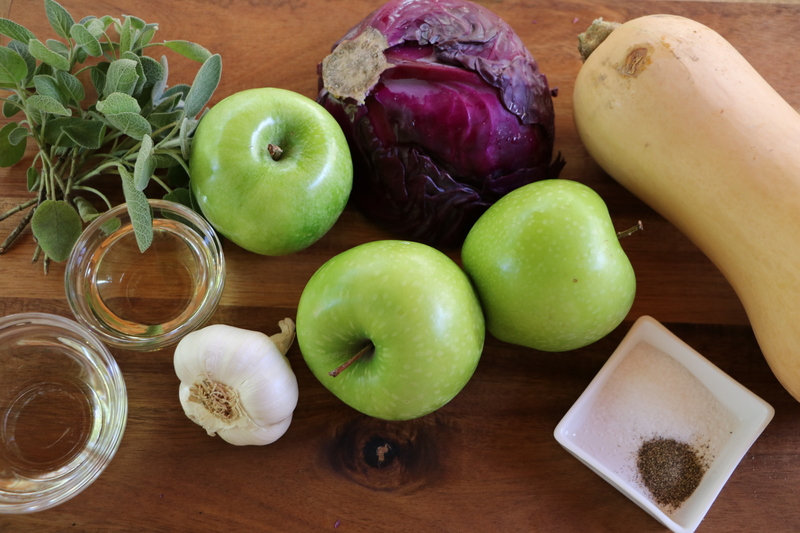 Then add the cabbage, apple cubes, orange juice, vinegar, salt, pepper, bay leaf, and ground cloves. Cook for about 20 to 30 minutes over medium low heat until the apples are tender when pierced with a fork. Keep warm until ready to serve. After removing from the oven, allow the pork loin to sit for 10 minutes. Then gently cut the cooking twine and remove from the roast. Using a serrated knife, cut the tenderloin into 1 inch slices. Put about 3/4 cup of the braised red cabbage on each serving plate. Top with slices of the stuffed pork tenderloin.